Pedestal sink? No counter space? No problem. This beauty has been tested and approved by a 6 and 8 year old, so we know it's both good and good looking. Choose natural board or white board. Both are salvaged from a rural barn that just couldn't be left behind. Looking for a custom size? Great. Just contact us. We've made these as large as a half gallon jar for commercial use. Want red barn wood? We'll scout that for you too. We love custom projects. There are few items that get used more often than the household hand soap dispenser. So what better way to inject a little useful everyday vintage into your routine? They are also a great price point for bridesmaid gifts, hostess gifts, thank you's and anything else you can think of. Get your bridesmaids something they'll use again.......they'll thank you. What's more.......foaming soap is earth friendly. It uses less soap than ordinary pump gel and can easily be home made to fill your own dispenser. We'll even send you the recipe we use. There are many of these on Etsy and elsewhere online. Ours is better. 1. We use original zinc lids......and they're not just better because they look better. Zinc doesn't rust, it does corrode over time, but we have found that it lasts longer than the other cut metal tops that don't look as good. 2. We use original orange rubber seals. The ones your grandmother used when she canned jam. It completes the look and seals the lid from leaking from the edge. You can request one with this wall mount version if you like that look. Since this one can't tip over, we didn't put one on to prevent leakage. 3. You won't find better customer service than right here. Read our feedback, we don't need to tell you, our customers will. 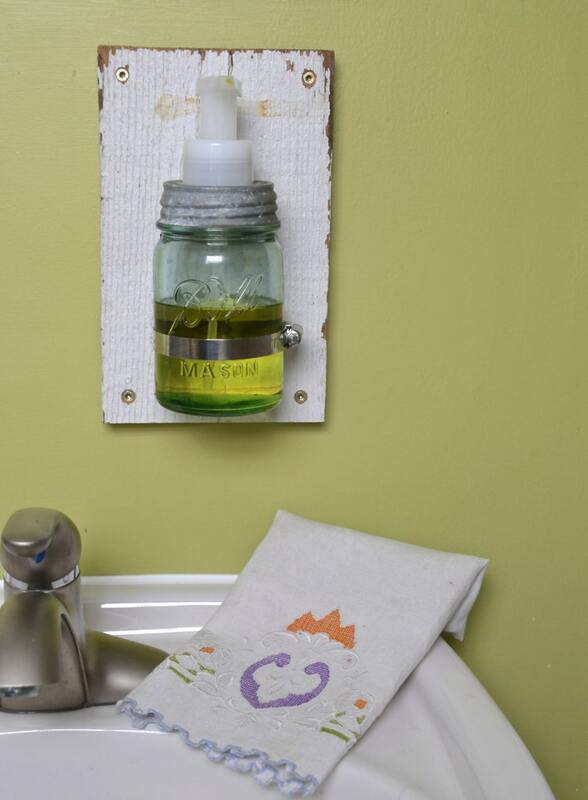 Dimensions: 9 1/2" tall x 6" wide x 4 1/4" from wall for the soap dispenser shown. For the larger size jars, the board will be larger for the Half Gallon size. All items are shipped and packed with the utmost care but in the event of damage during shipping, we've added insurance for your protection. We are happy to combine shipping. Just email us and we can get you on the road to brown paper and twine in a snap. Likewise, if you are looking to gift your favorite someone……let us know, we’d be happy to ship your item gift wrapped directly to save you a step. If you like what you see, come and visit us at sugarSCOUT.com where you will find some of the glorious ‘do-Overs’ we feature here on Etsy as well as our blog and contributors information. Thanks for visiting. We’re glad to meet you. I love this! It’s a perfect addition to my G wall. 🧡 Thank you! I love these stools! They are unique and custom made. Great shop to work with too. Delivery took longer than expected and the stain on one of the wood seats is spotty. Not too concerned since I'm sure our family will add its own wear and tear. I love this soap dispenser! We accept PayPal and credit cards as our primary forms of payment. If you need to explore paying with a personal check or money order, please contact us via email. We want no scouter to be discouraged from engaging in a transaction due to payment restrictions. If an item is grossly misrepresented, or you feel that you have received an item that was defective in some way, please email us and we will make sure you feel you have been treated fairly. We require all returns and exchanges to be completed within 30 days of purchase. Unless defective or damaged, our custom made and custom painted goods are not returnable. However, please know, we are selling handmade & vintage goods. None of which are perfect. Use good judgement when making your purchase. If you have questions, please ask them prior to the sale. If you would like additional photos, please ask. We are a small business whose pricing is based on the items for sale. We are not in business to make money off shipping your goods. Our best efforts are made to ensure that shipping charges cover your item being packaged & shipped safely, fairly and expeditiously. We also do our best to ship from our place of business as each trip to the post office requires time, gas & patience. However, if you have requests based on shipping your item a particular way, please ask. International scouts, we love you and would not be where we are without your business. For any item on our site, please feel free to email us and we will provide you with a shipping quote. We will be happy to ship for the cost of the item only.